This is my favorite chili recipe, although I have to say I absolutely love Creamy White Chicken Chili and Black Bean and Chicken Chili too. Our Game Day Chili is hearty and filling–with meat, beans, DIY chili seasoning and just plain goodness. I love it because I can just cook up some meat, and then dump everything into the slow cooker and let it sit all day. When it is cold outside, its the perfect time to cook soups and stews that will keep you warm from the inside out. You can cook this chili up on the stove top, or put it in your slow cooker so it will be ready when you get home from a long day at work. 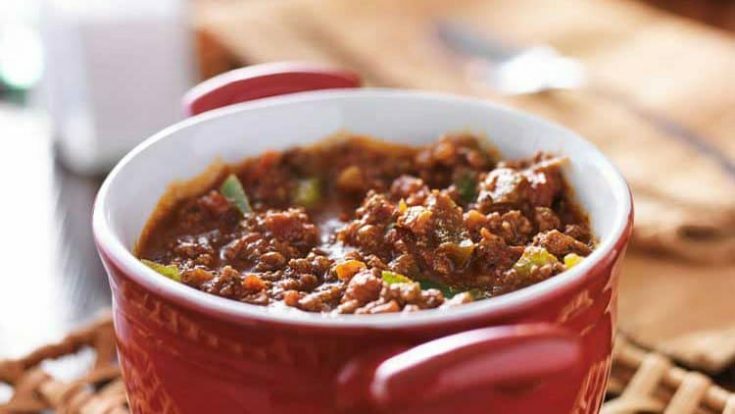 Take this top rated chili recipe with you to your next tailgate party. It’s easy to cook and carry with you when you use a portable slow cooker and carry case. Toss in a slow cooker liner and then all the ingredients, and you’ll be ready to enjoy a tasty chili recipe without the hassle of cleanup. Slow Cooked Chili is the Best. When I’m ready for dinner it’s there, ready and waiting, ready to grab quickly between school and whatever sporting practice we have scheduled for the evening. Fast and easy meals are an essential ingredient for happy campers at my house. No one likes to feel rushed, and when the meal is already ready, there’s no hurry needed. Brown meat, chop onion, and combine all ingredients in crock pot and cook on low 6-8 hours. Turn on warm and eat when you can. This chili is perfect for game day gatherings, relaxed family dinners, and any occasion when you want to have a meal ready to go without all the hassle.